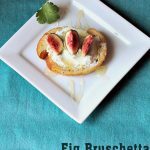 An easy bruschetta recipe with fresh figs, goat cheese, and honey. The honey adds the perfect amount of sweetness to counteract the bitterness of the goat cheese. I love making bruschetta recipes on the weekend for a quick appetizer. Bruschetta is typically made with bread, olive oil, salt and pepper, and a tomato-based topping. I decided to switch it up a bit and add some fresh figs and goat cheese instead. I had never had a fresh fig before. My only experience with figs had been eating fig cookies, and come to find out, the fresh fruit tastes nothing like that. It is very light and a bit sweet. I also happen to love goat cheese. When these ingredients are combined, it creates a delicious medley that will melt in your mouth. This is truly the perfect snack. Spread thin amount of butter on tops of the slices of french bread, enough to brown when toasted. Place bread on a cooking stone and bake for 20 minutes. While bread is till warm, spread desired amount of goat cheese on top. Half fig fruit and cut each half into thirds, lengthwise. Add three slices on top of the goat cheese. Drizzle honey over the top of the bruschetta. 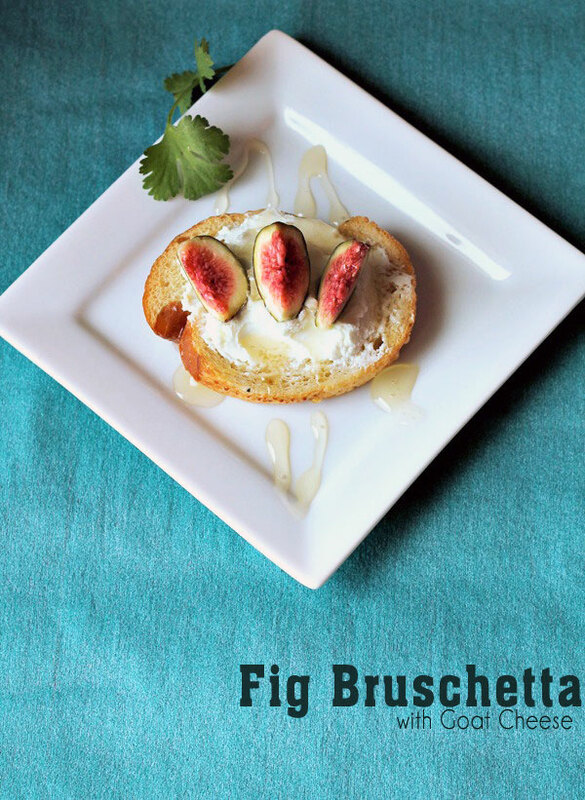 What do you think of the fig and goat cheese combination? I wasn’t sure that I would like it at first, but really what made this recipe was the honey drizzled over the top. The honey adds the perfect amount of sweetness to counteract the bitterness of the goat cheese.